Mapping urban experience. Innovative work! User experience measurement is about much more than only hardware and software. Researchers at MIT have created an online tool to help discover what effect urban looks have on people's perception of a city's safety or their own prosperity. 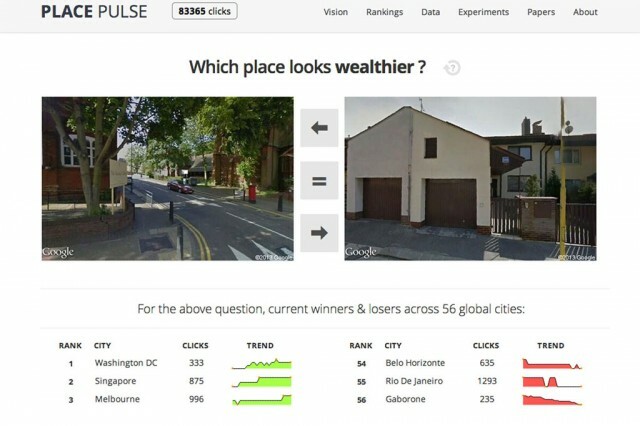 By placing images of selected cities taken randomly from Google StreetView side by side, the Place Pulse tool was used in a study to allow users to compare and choose the photo they thought came closest to matching certain attributes. They were asked to rank locations by answering one of three questions—"Which Place Looks Safer? ", "Which Place Looks More Upper-Class?" or "Which Place Looks More Unique?". The answers were then algorithmically compiled to give areas a score out of ten for each of the attributes, which were then transformed into maps. Photos were drawn from four cities—New York and Boston in the US, and Linz and Salzburg in Austria. Researchers discovered a greater disparity between extremes for class and safety in the US cities than in the Austrian cities.